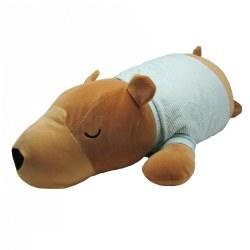 Children need softness in their physical surroundings and toys. Soft furnishings from Kaplan include carpets, area rugs, cushions, padded chairs and couches, beanbag chairs, and loungers. 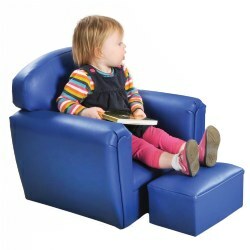 Create a cushy area for children to relax, read, or enjoy quiet play. 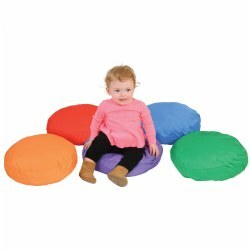 Soft seating and cozy corners are vital in providing uncluttered and comfortable environments for children, allowing for them to control the amount of stimulation they’d like to receive. 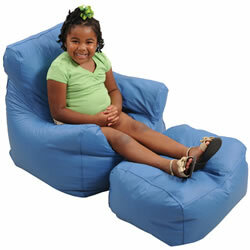 Look to Kaplan to provide cushioned seating, pillows, plush animals, and more for your classroom. 18 months & up. 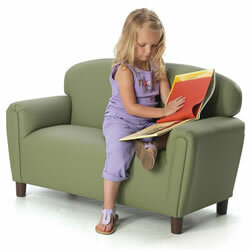 Specially designed for childcare centers, this comfortable, flame-resistant, children's furniture is easy-to-clean. 3-piece set includes couch (31 1/2"L x 17 3/4"W x 17 3/4"D), chair (17 1/2"L x 17 3/4"W x 17 3/4"D), and ottoman (7"H x 10"W x 8"D). 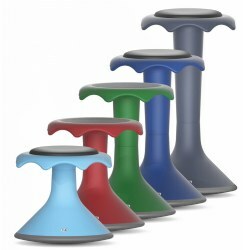 Hokki Stool 12" - 20"
Specially designed for childcare centers, this comfortable, flame-resistant, and easy-to-clean children's couch is available in blue vinyl. Couch measures 31 1/2"L x 17 3/4"W x 17 3/4"D. Made in the USA. 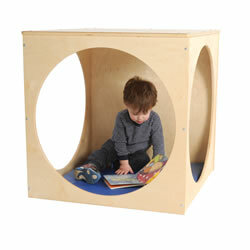 This quiet, comfy cube is a great place for children to relax and reflect. The six-sided cube has three circular openings, two solid sides, and an open bottom. Minor assembly. 24" mat sold separately. Measures 29"H x 29"W x 29"D. Minor assembly. Mat shown is sold separately. 18 months & up. 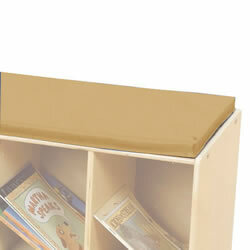 Specially designed for childcare centers, this comfortable, flame-resistant, children's furniture is easy-to-clean. 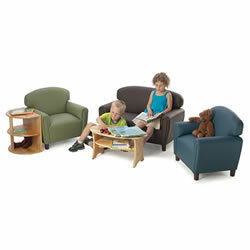 Set includes chair (17 1/2"L x 17 3/4"W x 17 3/4"D) and ottoman (7"H x 10"W x 8"D). 12 months & up. A woodland adventure is just a book and snuggle away! 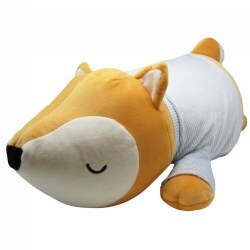 These marshmallow-like stuffed animals makes a great hugging pillow when reading a good book or taking time to daydream. 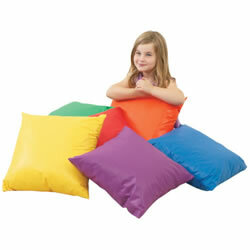 Each pillow measures 26"L x 9 1/4" x 10 1/2"W. Machine washable. 13 months & up. 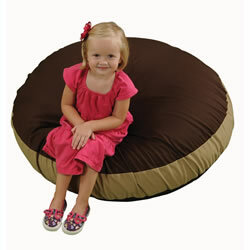 Cushion is shorter and wider than beanbag chairs. Twill cover features protected zipper for safety. Machine washable cover. Measures 38" diameter. Available individually, in a set of two, and in a set of three. 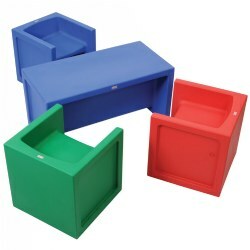 Designate comfortable, personal space with multi-colored cushions with carry handles! 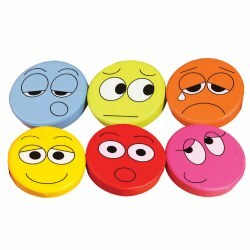 Made of high quality vinyl with 2" thick foam, 12" diameter. One each red, yellow, blue, and green. Surface washable. Made in the USA. 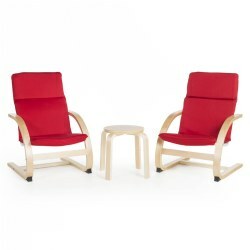 Ideal for your reception area or dramatic play area. Lightweight hardwood frame and washable fabric seat covers. Assembly required - tools included. Seat height is 10 inches, table height 12 inches. Wt. 25 lbs. 3 - 6 years. 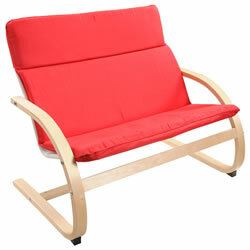 This furniture has all the comforts of home with the durability and quality built in for everyday use. The Enviro-Child Upholstery offers an eco-friendly and healthier upholstery alternative that resists stains and is as easy to clean as vinyl. The premium polyurethane covering has an antimicrobial finish that inhibits growth of bacteria and viruses, PVC free. Measures: 26"L x 18"W x 24"H. Seat Height: 12". Toy not included. 2 years & up. 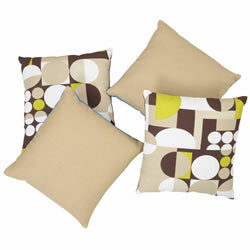 Comfortable round pillows in bright colors. Includes blue, red, green, purple and orange. Both the removable cover and the polyester fiber filled inner bag are machine washable and dryable. Each measures 17"D x 4" thick. Set of 5. Stain resistant soft vinyl, cleans with soap and water. Child safety zipper. Dimensions: chair 28"H x 23"W x 23"D, ottoman 10"H x 20"W x 16"D.
All ages. This set of 4 reversible accent pillows in neutral, homelike colors coordinates beautifully with a variety of furnishings and decor. 9" square. Machine washable. 3 - 6 years. This sofa has all the comforts of home with the durability and quality built in for everyday use. The Enviro-Child Upholstery offers an eco-friendly and healthier upholstery alternative that resists stains and is as easy to clean as vinyl. The premium polyurethane covering has an antimicrobial finish that inhibits growth of bacteria and viruses, PVC free. Sofa measures 38"L x 18" W x 24"H. Seat Height: 12". Use indoors or outdoors! Constructed of lightweight molded polyethylene and completely waterproof. Seat heights of 7" or 9"! Each piece had rounded edges and can be turned over to become 15" high tables. 15" high cube chairs. 15" x 30" bench may also be used for adult seating. Includes 3 cube chairs and 1 bench. Soft, comfortable seating with double-stitched seams. Spot clean vinyl cover with damp cloth. Locking zipper system keeps filling inside. 26" diameter. 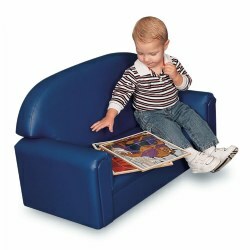 Your child can have his or her own couch! Has a "springy" rocking motion. 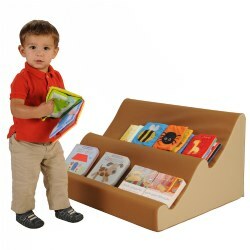 These sets are ideal for dramatic play, reading or quiet time. Light, yet sturdy construction. Measure 31.5" W X 19" D X 25 1/2" H. Seat height 10". Assembly required. 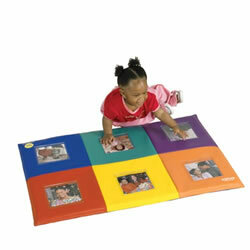 Place the photo mat on the floor to let children recognize their favorite pictures. 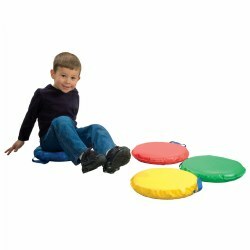 Soft durable colorful vinyl, just like an activity mat. Contains 6 vinyl pockets to insert 3 1/2" x 5" photo or picture. Surface washable. 36"L x 24"W x 1"H.
6 months & up. 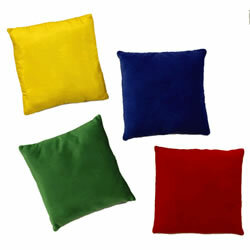 These 17" soft square pillows come in bright colors that are as fun to crawl over as they are to lay on. 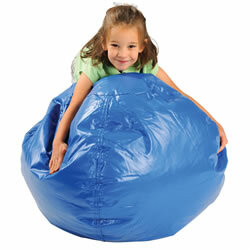 Both the removable cover and the polyester fiber filled inner bag are machine washable and dryable. Made in the USA. This cushion can be used with our Book Bench, item #12381 or used alone. Measures 46 1/2"L x 14 1/2W x 1" thick.